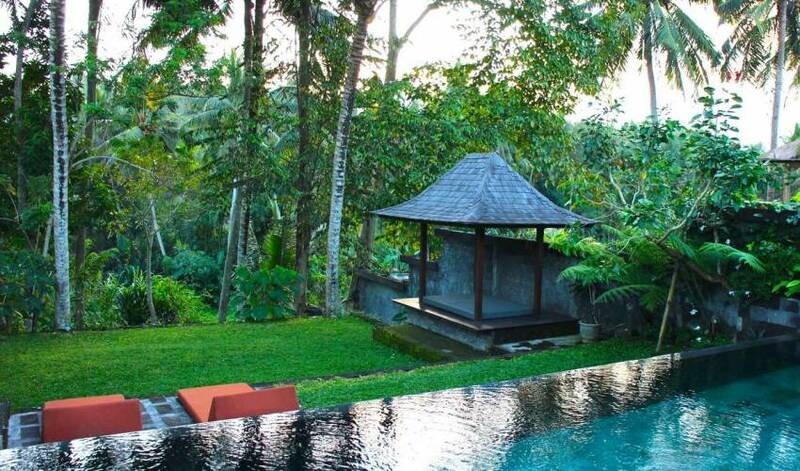 Nestled on sacred lands in Kandangan, Mas, Ubud, Bali, the villa compound sits along the Titibatu River, offering beautiful rice field views, a close connection to village life, and the peace of natural surroundings. 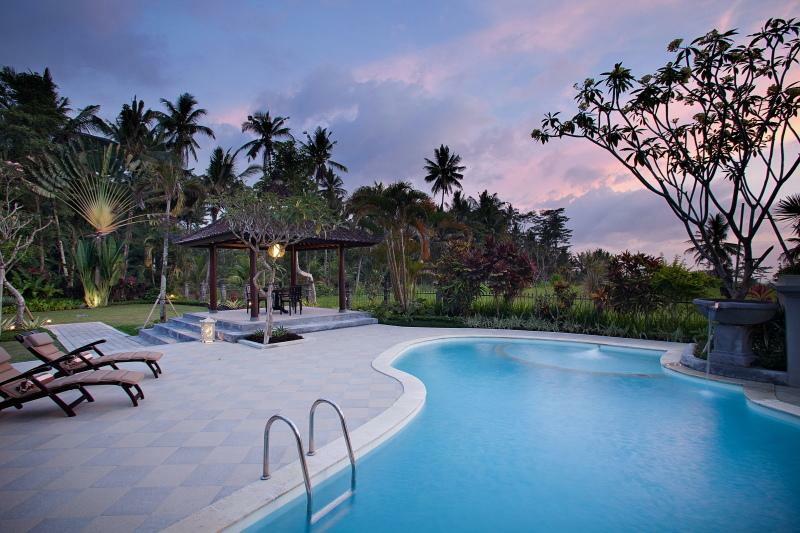 Situated just 5 minutes from the famous cultural town of Ubud, the villas offer a quiet getaway while still being close to all of the activity. 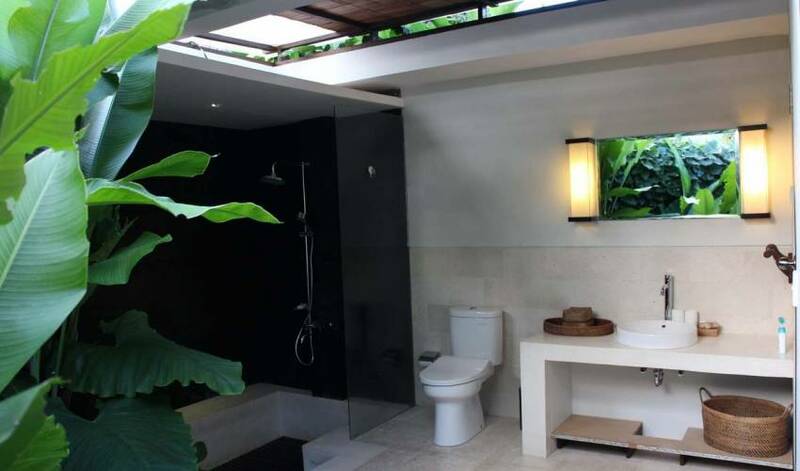 The villa compound is custom designed featuring recycled wood, natural stone, and vertical orchid gardens, and our private swimming pools and yoga studio, make them a magical place to reflect, rejuvenate, and relax. 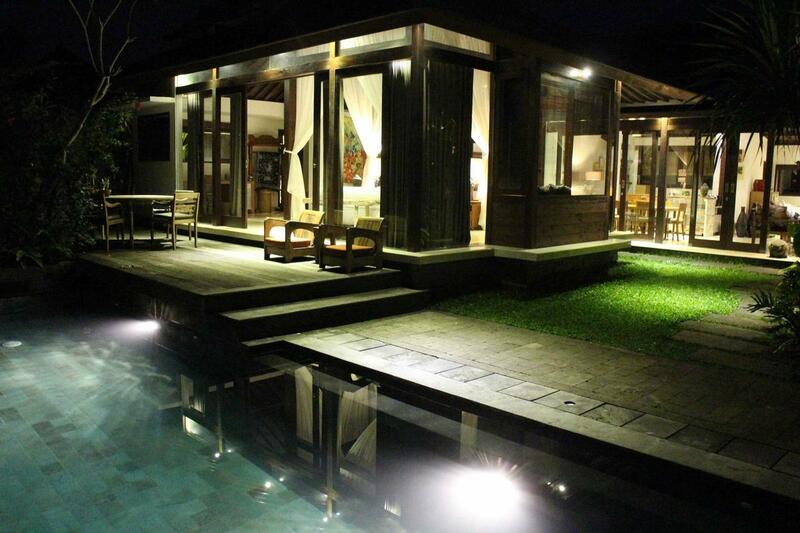 Situated on ancient family land just downstream from an important temple, the villas are blessed to receive waters flowing in the river valley, enlivening the gardens, rice fields, and architecture with a sacred energy. 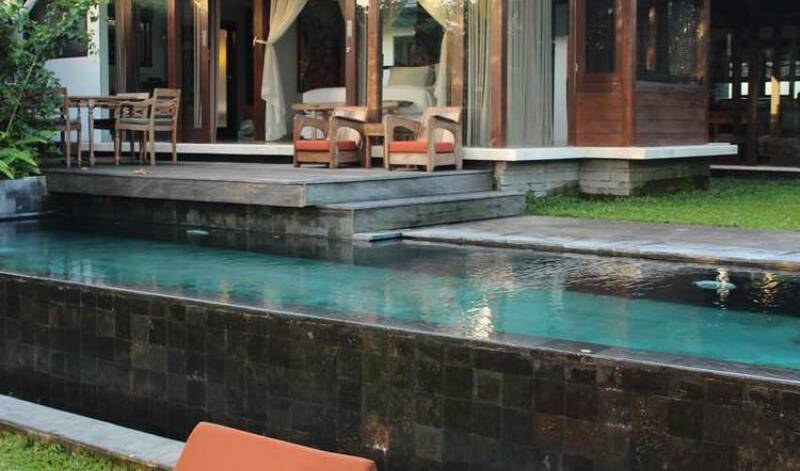 The property offers an office, 5 villas, 7 suites, 5 swimming pools, a large yoga studio, a Javanese-style joglo, sitting bales, beautiful common areas, the Indra Loka river lounge and restaurant, a juice bar, and beautiful gardens, all designed into the contour of a rice field river valley to recreate the feeling of ancient times mixed with modern luxury and clean comfort. 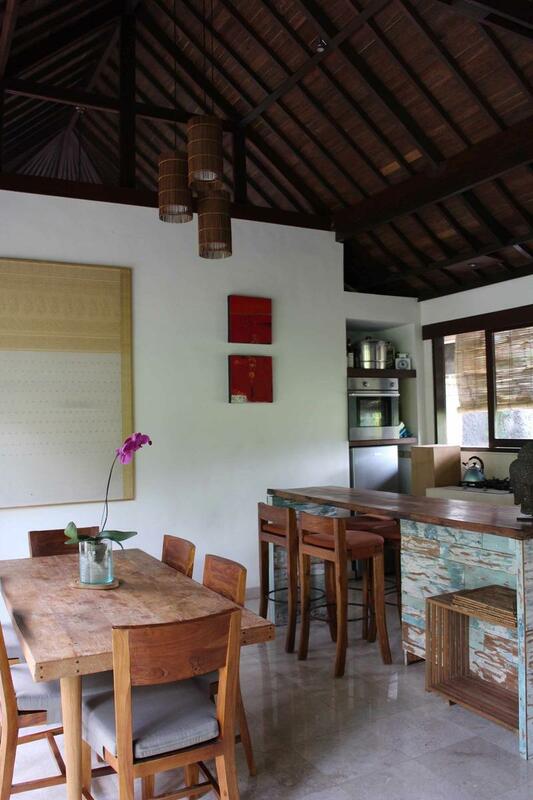 The villas are located amongst rice paddies on a village road in a quiet setting, yet are only a few minutes drive from the cultural center of Ubud. 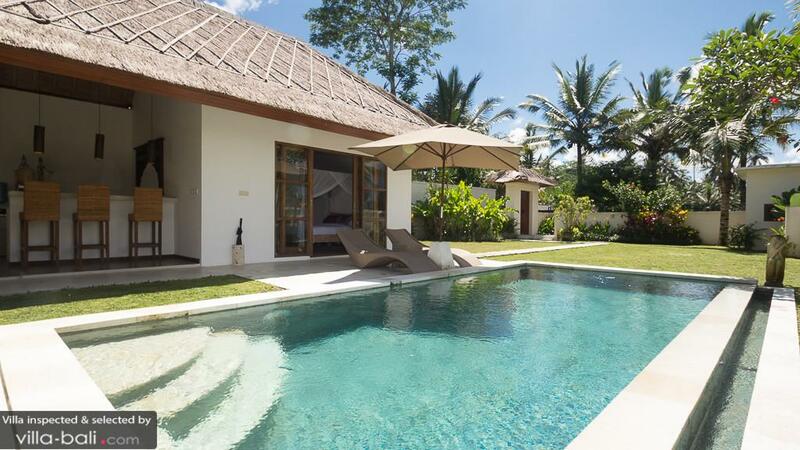 The villa’s position to the south of Ubud makes it easy to take day trips to the beaches in Sanur, Seminyak, or Kuta without any of the traffic of town. Each day the local priest’s wife places offerings in and around the property to bring a good spirit and great smells to the area. The local banjar (community meeting place) is just a short walk down the road, and one can sometimes hear the faint sounds of the village gamelan practicing as the sun sets. 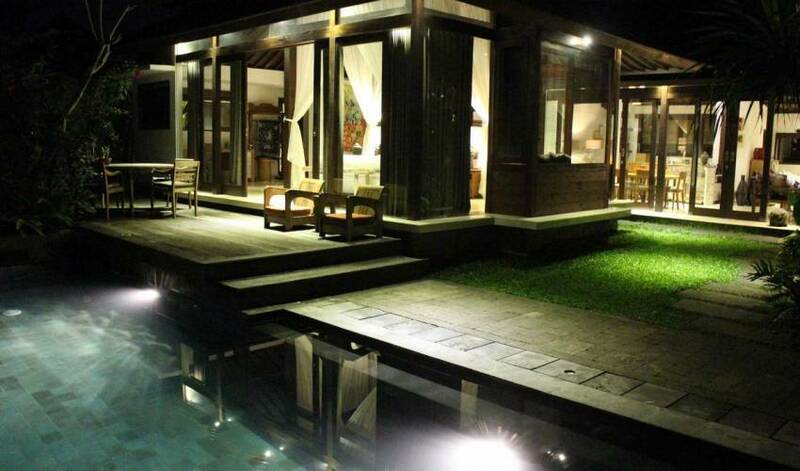 The property shares a parking area and fully trained team staff. Included in the villas’ daily services are: daily maid service, linens and towels, wireless internet and cable television, and daily breakfast. 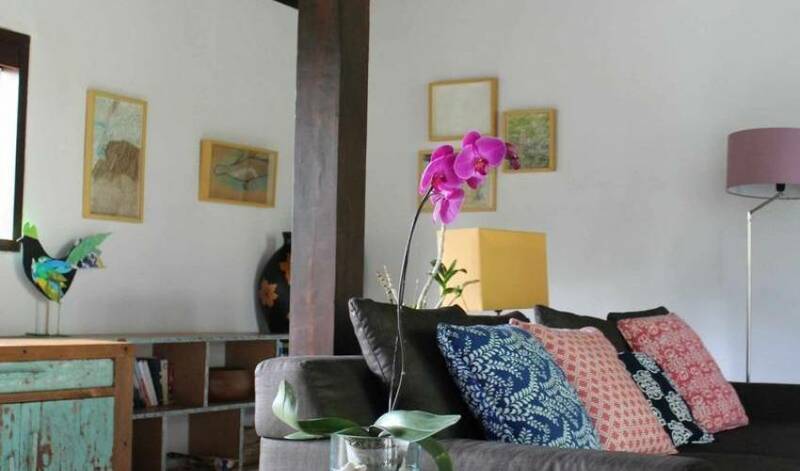 Airport transfer, driver to other attractions, massage, yoga classes, traditional Balinese meals, laundry, rental cellphone, rental motorbike, and babysitting can be arranged for an additional fee. 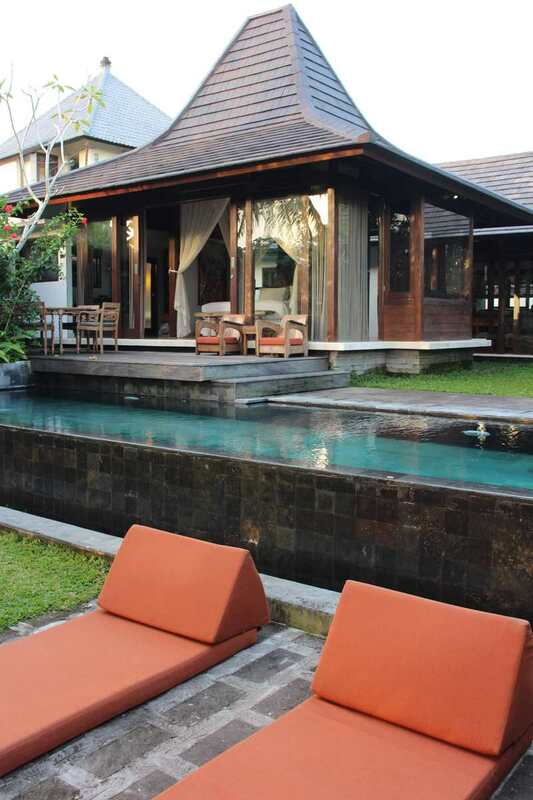 This villa is called the Villa 3500 because the large master suite was created from a re-purposed Javanese style house called a joglo. The large, king-size, four-poster bed is situated in the center of the joglo, allowing for a beautiful look at the traditional wood carvings on the ceiling as you lay down to relax. 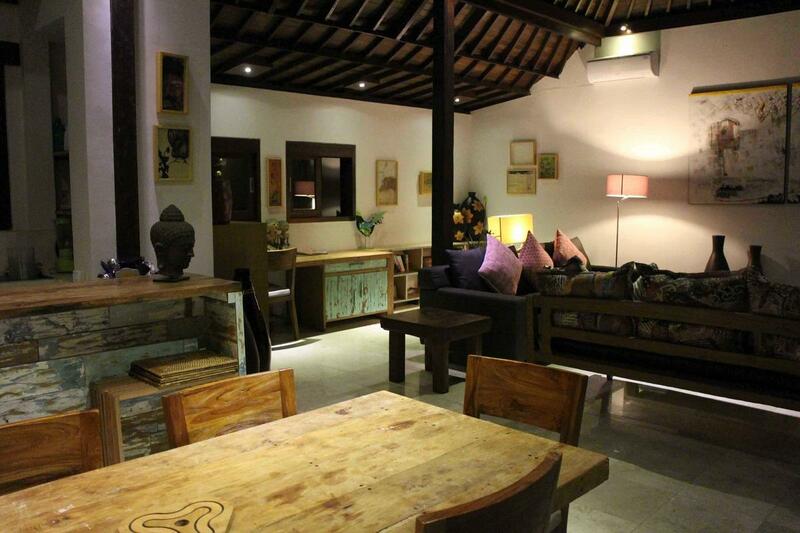 When I built this villa, I wanted to draw upon the woodcarving and painting expertise of my fellow village members, so I decorated it with original Balinese art, hand-made furniture, and detailed architecture (in many cases I utilized reclaimed, recycled wood). 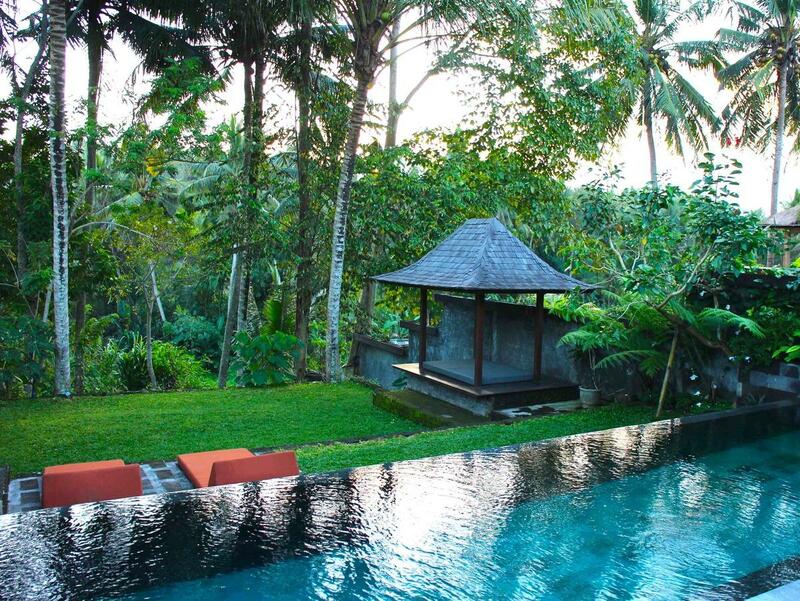 The villa also features green gardens and lawn, an infinity pool with a bridge, and a sitting gazebo which sits on a small bluff overlooking the jungle, rice fields, and ravine below. 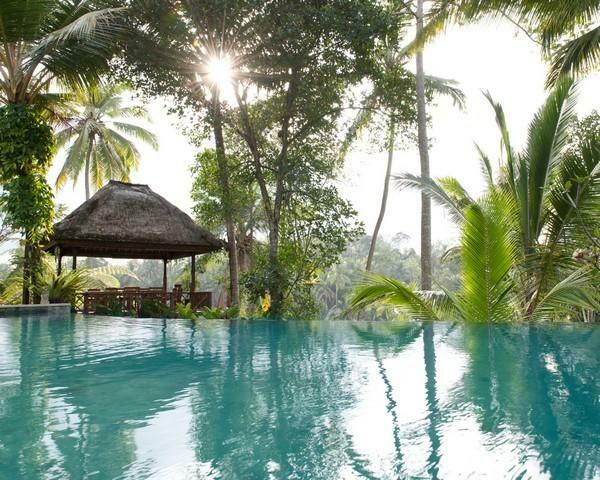 A great place to relax, rejuvenate, or be inspired. The kitchen, dining and living room are combined into a single spacious area and are surrounded by sliding and folding glass doors that allow for open living or an enclosed air conditioned space. 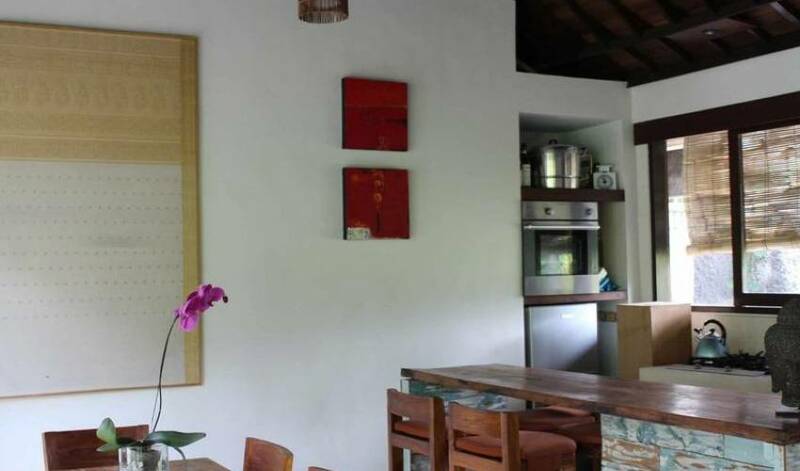 The kitchen is fully equipped with stove, oven, refrigerator, blender, coffee maker, toaster, etc… and overlooks rice fields at the back of the house. There is bar seating for four and the dining table seats six. 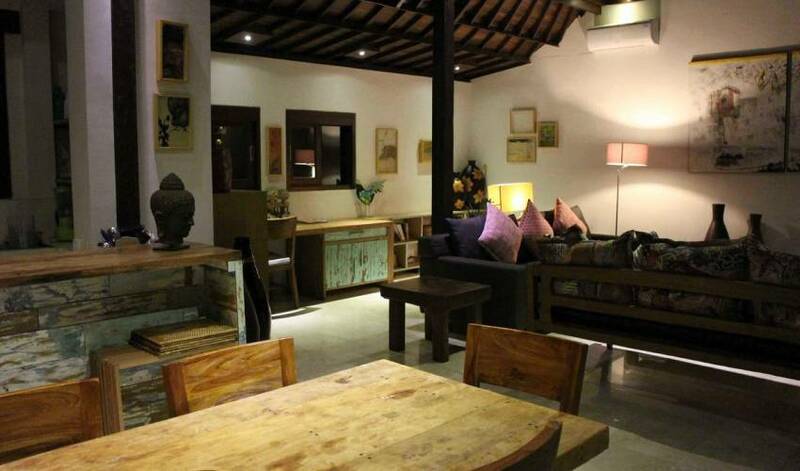 The living room offers a couch, lounge, writing nook and a flat screen cable television. There are also a number of places for lounging outside – on the deck, under the sitting gazebo, or on the loungers next to the natural stone infinity pool. The large master bedroom offers a super king size bed, a sitting nook (which can also serve as a bed for a small child) a tv with cable television, a desk and writing nook, plentiful closet space and a luxury en suite bathroom that is partially open air and has its own small garden. A second bedroom has two twin beds that can be combined into a king bed, desk area and couch seating (a small child can sleep on the couch in this room as well). 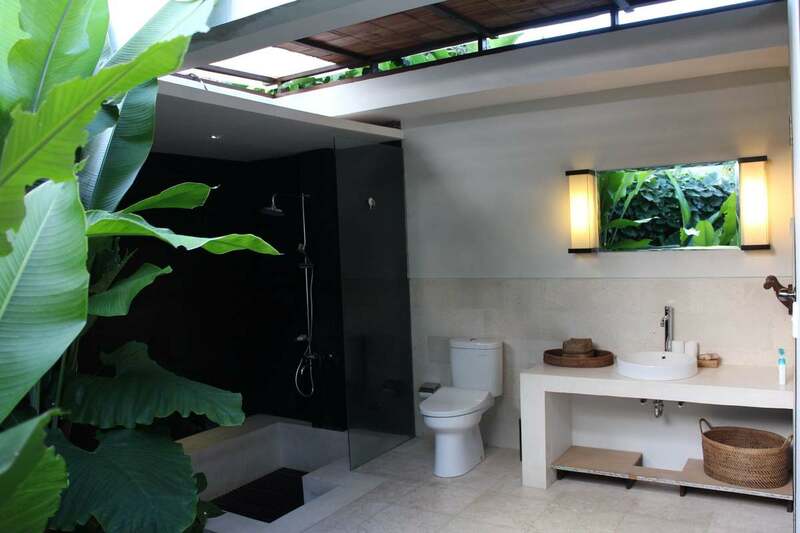 The second bathroom is located next to the second bedroom at the end of the house. 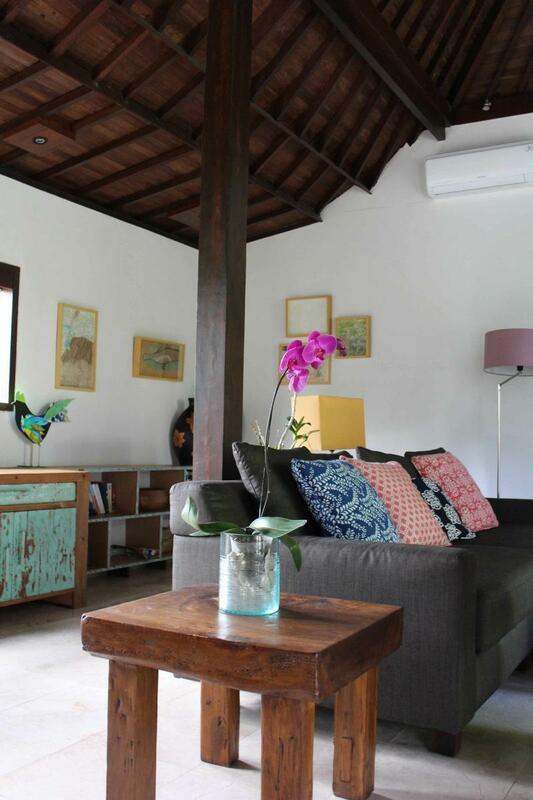 Both bedrooms offer fan and air conditioner.